Who knew there was a little piece of Spain in North Africa? Two little pieces, in fact. Representing strange remnants of the Spanish Empire and the days of Ferdinand and Isabella, and now part of the European Union, the port towns of Melilla and Ceuta are each completely encircled by Morocco and the Alboran Sea. Understandably, the Moroccans aren’t very happy with this arrangement and have made a territorial claim for the sovereignty of both. While Ceuta sits almost directly under Gibraltar on the map, Melilla is an 8.5 hour trip south from Granada by car and ferry. In real life this may have swayed us towards Ceuta, but travelling virtually means we can avoid any or all transport we like. Hours and hours on a car ferry, with the smell of diesel fumes and other passengers’ packed lunches isn’t my ideal way to spend a day, even with the possibility of meeting interesting people. By far the biggest drawcard for me was finding out that Melilla has the second highest number of Art Deco and Modernist buildings in Spain after Barcelona, thanks to the arrival in 1909 of Catalonian architect Enrique Nieto. Nieto was hugely influenced by Antoni Gaudí and his work took off like wildfire in Melilla, with almost 900 buildings being constructed within a couple of decades. I think Leroy is a little worried I might be planning to drag him around to all of them. But it’s not all about Modernisme. Melilla la Vieja, an amazingly well-preserved medieval stone fortress, dominates the town and apparently there are some good museums. I’d be happy to just wander and get a feel for the place and its diverse population of Spaniards, Riffian Berbers, Sephardic Jews and Sindhi Hindus. Fairly cool (14°C), it’s an excellent day for wandering and eating tapas or a bocadillo – and practicing our Spanish. 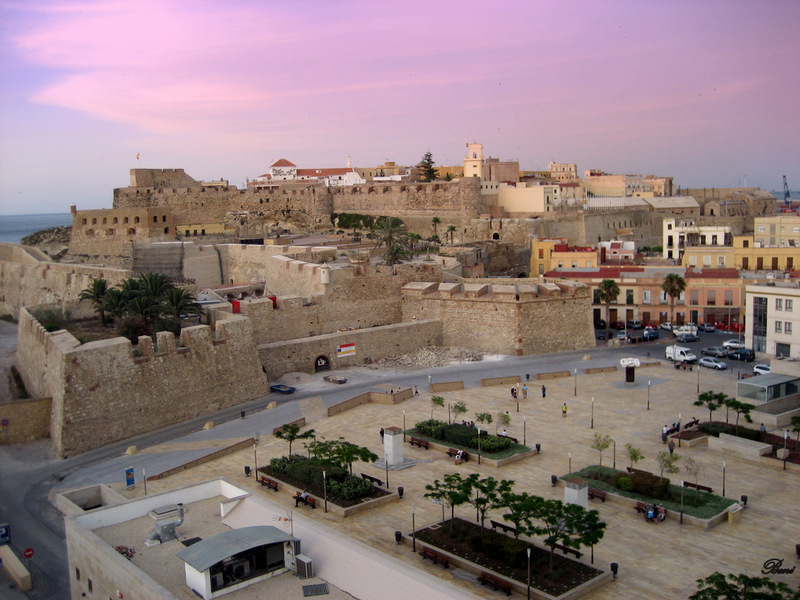 Something we’ve already noticed: the Moroccans pronounce Melilla meh-LEE-lee-ah while Spaniards pronounce it meh-LEE-yah. It’s pretty confusing and we’re now avoiding calling it anything at all.